Potty training isn't easy, but that doesn't mean it can't be fun. And one mother found a way to get her toddler in the potty training spirit. 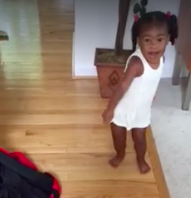 Stacia D. Wright made a potty training song for her 2-year-old daughter, and it's gone viral. Then the adorable 2-year-old follows by singing, "In the potty." But that doesn't mean she actually does it. Potty training is definitely something I was lucky enough not to have to deal with—thanks to my son's child care provider and my sister for doing the training for me! Because I probably wouldn't have made it.